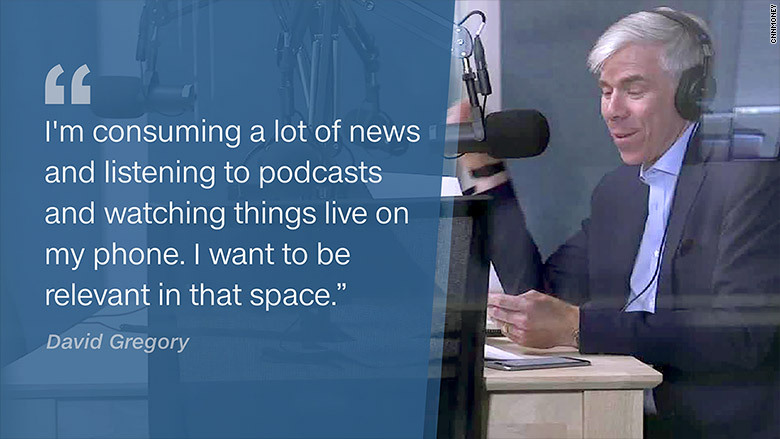 David Gregory is launching a podcast -- which means he is unlearning some of what he learned on "Meet the Press." While hosting NBC's Sunday morning political show, his questions were designed to "make news," in TV parlance, within the few minutes allotted for an interview. The guests were almost always political dignitaries, and the straight-laced shows were perfectly timed to the second. Podcasts are pretty much the opposite: free-wheeling, intimate and in-depth. "That's what's cool about podcasting," Gregory said. "It's different -- the informality of it, the conversational feel." "The David Gregory Show," which will be published weekly, starts on Friday in a deal with E.W. Scripps Company. Scripps, the owner of local TV and radio stations, is seeking to diversify by adding podcasting to its portfolio. Last year the company acquired Midroll Media, which has a network of advertiser-sponsored podcasts called Earwolf. Gregory's debut guest is Bravo host Andy Cohen. He has also taped conversations with Arianna Huffington, Dan Balz, Elizabeth Alexander, Jon Meacham and Sam Harris. He is set to interview Mitt Romney on Friday. Former NPR executive Ellen Weiss, now the Washington bureau chief for Scripps, is working with Gregory on the new venture. "I had to get used to the idea that I could sit down and spend an hour with someone," Gregory said in an interview with CNNMoney. "My mindset was, 'I have to be on point. I have to be on topic. I can't just meander.' Ellen said, 'Actually, yes, you can meander.'" At NBC News, Gregory walked a straight line. He spent 20 years at the network, six of those as the moderator of "Meet the Press," but was replaced in 2014. In the book he wrote afterward, titled "How's Your Faith?," he called his departure "the lowest moment of my professional career." So there's naturally some curiosity about what's next for him. His short answer is "I don't know." As of last month, Gregory, 45, is a part-time political analyst for CNN, mainly appearing on the morning show "New Day." He has the podcast. He speaks in public setting about his book. And he's going to be teaching at Tufts University. "I'm not trying to engineer any particular path," he said, when asked if he's aspiring to host a TV morning show or a "Charlie Rose" style interview show. "I'm trying to find a portfolio that's interesting; and be a part of different teams; and try new things." A podcast is one of them. The "Meet the Press" discipline, he said, was to ask, "How can I make news today? How can I advance the story?" But in the recording studio, "I'm not in a formal setting. And I'm more of a participant in the conversation." On CNN, Gregory is an analyst. On the podcast, he is an interviewer, able to show a wide range of interests, whether with an entertaining figure like Cohen or an atheist author like Harris. With Alexander, the acclaimed, poet, "My approach was to ask, 'How do you come to really appreciate poetry, how do you do that?' We also ended up talking about Black Lives Matter, the Obama presidency, and how to write." While public radio existed when Gregory started working at NBC in the '90s, the notion of podcasting did not. The archetypal TV newsman described himself "stepping back, outside of a network, taking a look at the media landscape" for the first time in decades, and noticing the ways his own media consumption is changing. "I'm consuming a lot of news and listening to podcasts and watching things live on my phone," he said. "I want to be relevant in that space."